About the Carrs Mill, as about most things, we know very little. Human interest, which is largely stimulated by details of other people's lives that those people would rather have kept private, is almost entirely absent from this story. We have little more than the dates, names and numbers people see fit to put in registers and account books. One thing we can say, however, is where it stood. The Carrs tells us. 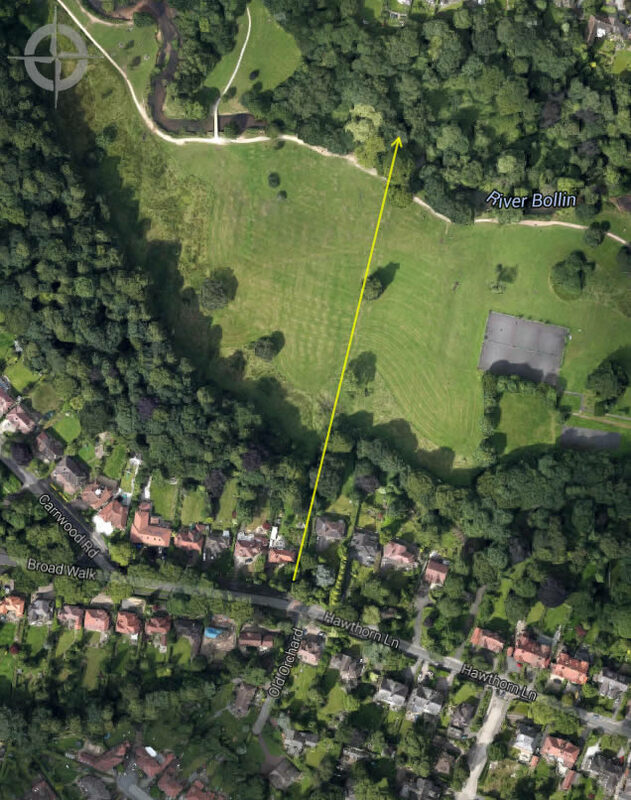 Tear yourself away from the playground, cross the first bridge and head towards Styal. Where the willow pushes the path away from the river, look up to your left. There's an lime tree cloaked to its feet like a nun and, further to the left, a ash standing proud in front of the Hawthorn Lane woods. Walk till these trees are in line. Beyond the trees to the south is the point where Hawthorn Lane becomes Broad Walk. Behind you, and over the river, is where the mill once stood. (Those trees mark the old boundary of the Pownall Estate to the west and the Hawthorn estate to the east. It must have been a very different Bollin at that time, narrower and faster. As it is now, it is good for skimming stones, but would certainly not turn a mill wheel. 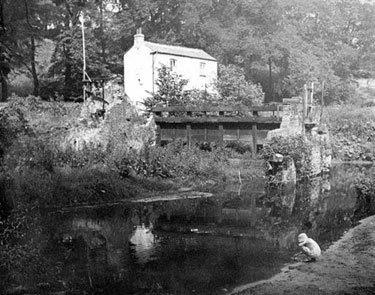 Yet that is the power the mill relied on for over 100 years, an undershot waterwheel whose water-power was boosted by the weir that was the only crossing between Pownall Bridge and Chancel Lane Bridge up to 1931. Built sometime around 1800 as a cotton mill, by 1828 the mill was in the hands of one Charles Barber, a silk throwster, or spinner. 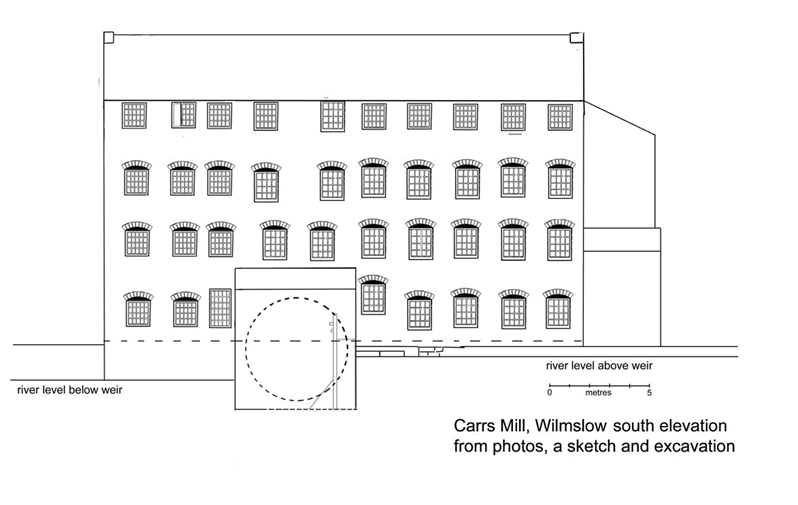 Wilmslow's proximity to Macclesfield had meant that silk spinning and weaving had become quite important in the previous century, with a concentration of home-weavers in Dean Row. The weavers were far fewer by 1851, when Barber's Mill counted 80 staff (12 men, 18 women, 20 boys, 30 girls). It had passed into the hands of his nephew by 1871, but thereafter changed hands several times (a fustian cutter called Ernest Platt had it for a few years) before becoming the Wilmslow Laundry in 1903. That is not the Bollin that we see today. Finally we have a voice. True, it is an advertising voice, but there is reason to believe that something of the human can be found even there. "We return everything but the dirt. Situated in the heart of this pretty country district... our motive power is WATER, so we make no smuts to fall on your linen whilst generating steam". "We make no smuts to fall" - you could sing that, if you were that way inclined. The lighting was electric. There was a machine for table damasks, one for shirt finishing, another for collars, a goffering machine (a goffer was an iron used for pressing ridges or narrow pleats) and another for erecting shirt collar bands. There was also a hydro-extractor (they could hardly rely on the sun, could they?). The laundry first had its own buggy for deliveries in straw baskets but soon took on motorised transport. There was a Sorting and Packing Goods Department with a manageress, whose task it was to "prevent mistakes, this desirable end being greatly facilitating when customers' goods are plainly marked with name" (you've been told). There's an entrepreneurial air about the Wilmslow Laundry Limited. All things must pass. The Wilmslow Laundry did, but not before it had battled through flood in 1910 and fire five years later. Competition from Bray's Laundry on Hawthorn St or entropy or the rising tide of home appliances did for the business and sometime in the early 20s, it was bought by Henry Boddington, whose hand is everywhere on The Carrs. He threw money at it, replaced the windows and roof, did up the interior and painted a sign on the walls, The Calico Printers Association. They never moved in. 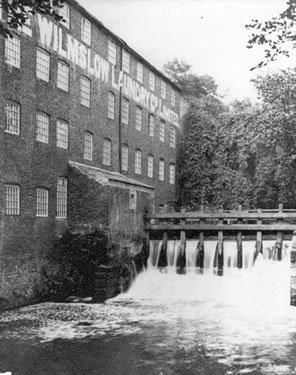 The mill was reportedly storing gelatine (though some say it was cellophane or even gelignite) when it burned down in 1923, and the new tenants (nettles, beeches, birches and rhododendrons) just didn't look after the place. 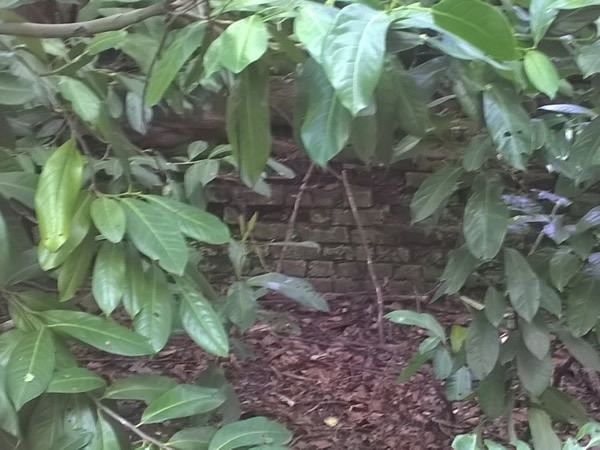 If you're willing to twist, bow and crawl (as well as trespass) along the other side of the river, you'll find a few bricks still one on top of the other, but little else. There was one remnant that survived longer and in better condition. Silk Mill Cottage had housed a watchman in 1841, the mill manager (or 'steward') in 1851 and then a succession of others right up to the Second World War. There are those still alive who remember it. Presumably, it was a major Luftwaffe target because, come 1945, it was gone. Thanks to Ray Acton, Christine Tonge and Ann Hodson. 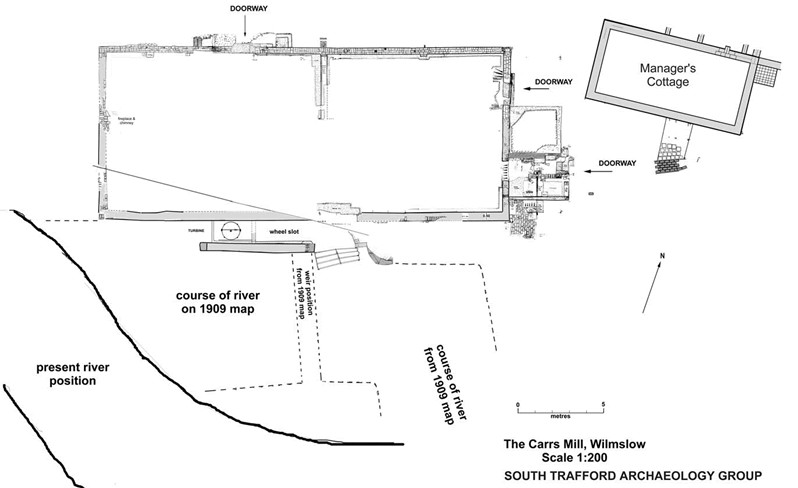 A plan of the Carrs Mill site, once again thanks to the South Trafford Archaeological Group.